The objective of the Camden SMART (Stormwater Management and Resource Training) Initiative is to develop a comprehensive network of green infrastructure programs and projects for the City of Camden. The Initiative is a collaboration between the City of Camden, Camden County Municipal Utilities Authority, Cooper’s Ferry Partnership, Rutgers Cooperative Extension Water Resources Program, New Jersey Tree Foundation, NJ Department of Environmental Protection, our public-private partners, community organizations, and most importantly, Camden residents to restore and revitalize our neighborhoods. The Initiative includes neighborhood green infrastructure projects, stormwater management policy development, and green infrastructure training programs. Get a FREE rain barrel for your Camden City home! 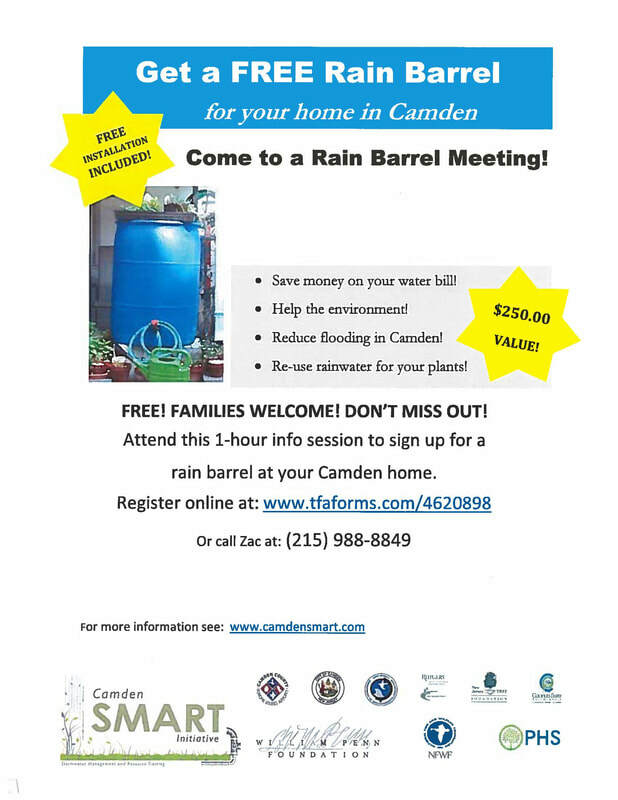 Come to this Rain Barrel Meeting to learn about Camden SMART's new Rain Barrel Program and sign-up for your rain barrel including FREE installation! Renters ARE eligible! CLICK HERE to Register for our FREE Rain Barrel Workshop! Please check the above link often, Camden SMART Partners will be coming to a neighborhood near you!